I installed Oculus Rift drivers downloaded from oculus.com/setup/. Everything is plugged in and installed properly. Oculus worked correctly, I tested demos, but the problem began at shutting down my computer. My PC couldn’t shut down on its own, I had to do it manually. Movies and VR games tested – all worked properly. This time the system was fixed fast and the previous-day backup was restored. What can be source of the error? That error is usually related to old or corrupted graphics card drivers. I'd recommend completely uninstalling the Nvidia driver (maybe use something like DDU to be sure) and then reinstalling the latest drivers from Nvidia. Also, if your system restore is not working, that could indicate hard-drive issues. You may want to run a scan of the hard-drive to check for errors and/or repair them. Thank you for the fast reply. Disc scanning didn’t indicate any problems. When it comes to Nivida driver, recently I’ve installed Nivida Geforce Experience. So do I have to uninstall the drivers? I made several attempts at my friend’s. One of them has played on oculus rift cv1 before and he didn’t have any problems with that. However, this time he had the same problem as mine. The second friend was testing oculus rift for the first time and he got the same problem when shutting down his computer. Both of them have Windows 10 and comparable computer’s specifications. Might be the problem connected with one of the latest Win 10 updates? Anything is possible, but I haven't heard many other people mention this error. Thank you Oculus! I ordered a third sensor including your USB cable from 2003? (It has only Win 98 / XP as supported systems on it....) and now it totally crashed my computer! Every time I put in the sensor I get a bluescreen "
Then I have to reset Windows (takes 20 minutes) and then the same happens again! Might be a USB issue. Try updating your USB drivers to latest (usually found on your motherboard website). Otherwise, try buying this add-on card. Can't remember exactly but I think this was the same BSOD loop I was in after reinstalling my OS. I restored to a previous point which allowed me back in (out of the loop). What worked for me: Update all drivers including USB drivers. Install Oculus software BEFORE plugging anything Rift related in. After the latest update I too am getting the exception and I can't boot in to safe mode either. So having to reset Windows 10 for the second time. Seems like a bug with the rift software because after a clean install with updated drivers it crashed as soon as I plugged it in. This is really interesting as I see more having the same issue. Because I had already encountered this error in much the same way this post really caught my attention when it was first started by kamskill, so I finally decided to go ahead and speak up as well. I too have dealt with this several times over already. After doing a complete reset/clean install of windows 10 the first time, and then a subsequent system restore or two, I haven't plugged my headset/sensors back in since. And found on my third or fourth BSOD exception error, if I restarted into the bios and disabled the USB 3 ports, I was then able to boot into windows normally without having to do a system restore again. The problem is for now I can't turn my 3.0 ports back on without getting the same exception error on startup, unless I would do another system restore. Which wouldn't be an issue really since I'm not far removed from the last restore of course. But at this point I'm just a bit tired of messing with it all, and not entirely sure where to go from here anyway. At least I can use the computer/windows in every other way I normally would. So along with any other tracking fixes etc., just hoping there's something in the next update that may possibly resolve this problem as well, if that is indeed the cause. And allow me then to use my 3 sensor touch setup without issues, which would be so nice. Like I said though, it is quite interesting to be seeing more posts from people having this same problem since the last update. my CV1 has been working fine for months, all of a sudden I get the BSOD with the System Thread Not Handled BS. I can't boot in safe mode and have now also restored my PC, saving my personal files, still to no avail. Can you please grab your log files as shown here? I'd also recommend contacting support about this issue. I hace exactly the same problem with my gtx1080 and also the same wiht an gtx1060. Please, could yo help me? I had the same problem on my system Asus Z170, EVGA 980ti. 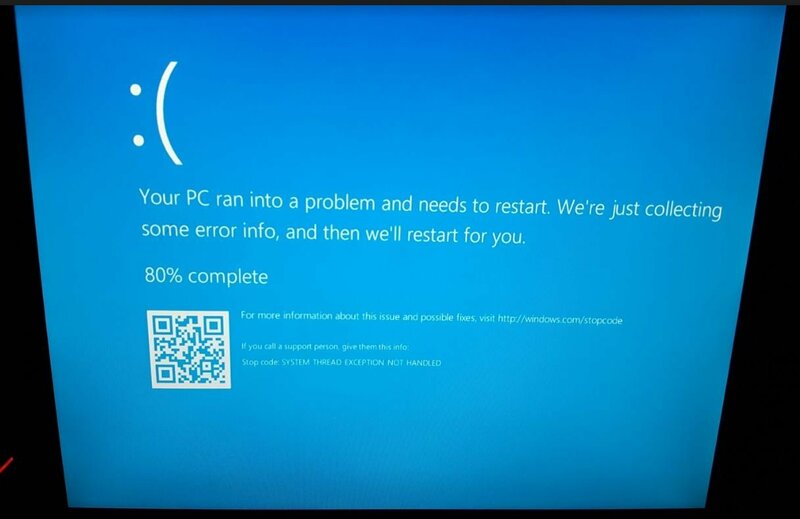 I did a clean windows installation and updated all the latest drivers and bios for the motherboard and the latest driver for the graphic card and I was getting random BSOD. Every time the BSOD happens I had to restore the computer from a backup image I made. I spent 3 days troubleshooting the problem, online search all points to graphic card drivers. I check nvidia again and they had released new drivers. I used that and so far no more BSOD. The only other thing I did different this time was I did not install the nvidia Geforce Experience. Have you tried all the suggestions earlier in this thread? I dont think it's a GPU driver issue in this case because I experienced the same error on a similar motherboard (ASUS z170 pro gaming), but the triggering of it was slightly different. In my case, I went to plug the HMD's usb cable into the 3.1 port and then the BSOD. OS was hosed and had to do what the win 10 equivalent of system restore is, which in my case worked fine. My guess is that its a combination of the chipset associated with this line of motherboards and the Rift drivers. Same boat here since whatever update took place the other day. Cannot even boot Windows in safe mode or otherwise if the Asmedia 3.1 USB hardware is enabled in the BIOS on our ASUS ROG G20. I have to shut it off to boot. I can then remove the driver, turn it on, install the driver and boot. But if I put the HMD into the normal 3.1 port it uses I'm back in the BSOD loop. I am having the same exact problem. I have an ASUS desktop as well with a 970 GTX. The box even said "VR ready" on the front of it. I've had my rift since December and have had ZERO issues until I tried to use it yesterday (hadn't used it in two weeks) and once I plugged it into my USB port I immediately got the BSOD with the same error. I had to do a windows reset and reinstall everything including oculus home. Once I had everything installed, I plugged my rift back in and immediately got the same error and BSOD loop and had to reset again. Needless to say I am pretty irate at this point. Has anyone found a fix yet? Sorry to hear that. Would you mind grabbing your log files and then uploading them here? You should also submit a ticket to support so we can better keep track of the issue. Thanks. Cyber, do I need to reinstall the oculus software do give you the logs? I can't get any logs after I plug in my rift because it will immediately crash my system again. I see. Yeah, it may be hard to pull the logs then. However, the Windows crash dumps may be useful if you can manage to login under safe mode. I'd recommend reaching out to support in any case for further help. Thanks. Oculus support isn't great mate and you know it. 48hr response!? Insane. I'd understand if I had a low end rig but it is far from it and was working perfectly fine yesterday. Waited a long time for the rift and now grimacing over the fact I'm going to have to return it. Once I get to the BSOD loop I can't run in safe mode at all. My only option is to do a full system reset. I'll reach out to support though. Thanks! Sparmane.. Do you have windows 10? If so, start up your PC and let it get to the BSOD again and it will restart and try to repair the error. Eventually it will give you an option to restore at a prior point. Select that and more than likely it won't correct the issue, however it will say that the repair failed and give you the ability to select advanced options. Click on the advanced options and in one of the options (Can't recall the exact one) you will be able to select "Reset this PC". Now, this will erase all installed programs and allow you to keep anything in your personal or download folders and will reinstall a fresh windows. This did the trick for me.